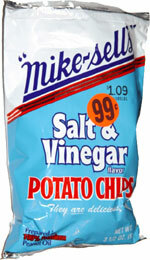 Taste test: These are excellent thin potato chips with a medium-strength vinegar zing and a soft crunch. You can taste both the potato and the vinegar, and the combination is excellent. As an added bonus, this bag included a good number of very large chips, and that can help to make a good chip into a great one. Smell test: Nice vinegar aroma with some zing.